Today's Sunday Supper recipe is cornbread. My dad probably rolls over in his grave every time I make my version of cornbread because it's nothing like his. 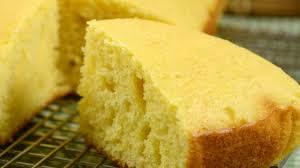 Mine is sweet and almost cake-like but I like what I like... And this cornbread always brings me joy. Blend all ingredients together until smooth but be careful not to over stir. Pour into a greased 8 x 8 baking dish and bake for 30 - 40 minutes or until top is lightly browned. Note: I think our oven is messed up which is why the cooking time fluctuates so much. Also, using a well oiled, preheated cast iron frying pan works well and reduces cooking time by about 5 - 10 minutes. That sounds delicious. Just last week I bought 3 different corn bread mixes because I can't ever find one I like. I might have to try your recipe. I never thought about Bisquick. My mom used it for everything-even her pumpkin pie. She made the "makes its own crust" recipe that used to be on the box and it was always delish. I've been looking for a sweet cornbread recipe. Yours sounds like the perfect one.